To fix an examination date, send an e-mail to andrea.bianco@polito.it at least one week before the date in which you would like to take the exam. In the e-mail, specify a set of possible dates (few days is normally ok) and provide a phone number at which I can reach you in case of last minute problems. The examination is a colloquium, typically taken in my office. 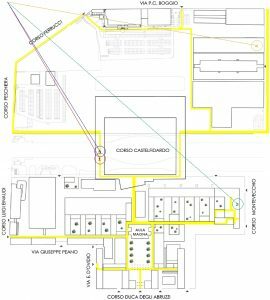 To reach my office (see point 2 in the below included map) look for the old site of the Electronics and Telecommunication Department, close to Corso Montevecchio area, first floor on top of room 12. Call me at my office phone number 4098. It is not necessary to reserve the examination date on the Politecnico Web portal. Indeed, offical examination dates are only an indication of possibile dates in which to take the exam. There will be NO exam on the official dates unless explicitely requested through an e-mail.